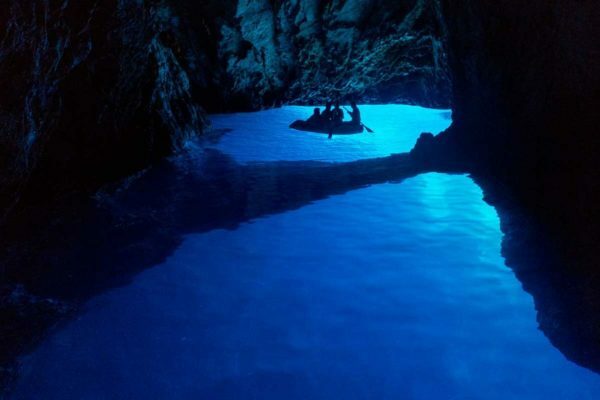 Odysseus cave or Pit is a cave on the island of Mljet. It is located on the southern coast of the island, near Babin Field. The Odyssey cave is an oval shaped cave with several dozen meters in diameter. There is a collapsed vault that is named after the Jama, because looking from the land side, it looks like a big hole in the ground. The bottom is filled with the sea. Through the limestone layers, separating it from the open sea, a tunnel penetration has formed, so a cave can enter a floating or smaller boat. The entrance from the sea side is 4 to 5 meters wide and above the sea level is only 1 to 1.5 meters. The depth of the sea in the tunnel cave is 8 to 10 meters, the tunnel itself is about 20 meters long. Access from the mainland is possible through very steep improvised stairs. 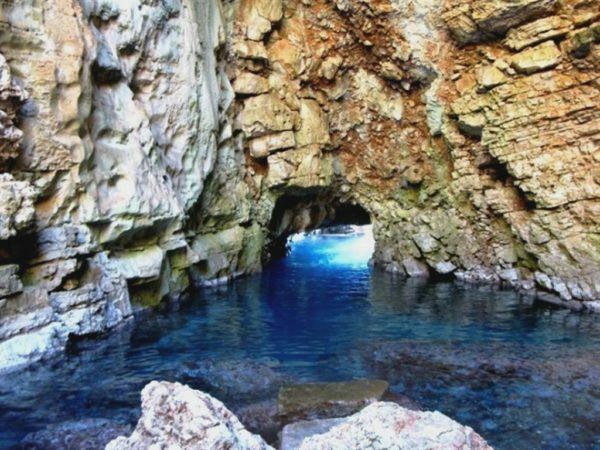 Odysseus’s cave is used as a shelter for fishing boats and a fishing tool: the net, today forbidden for mossy pits, parangas and paddles, and represents the most unusual port on the whole Adriatic, but also wider. In the summer months, around noon, when the sunlight strikes the caves in the caves, the color is created in the sea, especially interesting to tourists and lovers of true natural phenomena and photos. In the Jam itself, because of the high rocks, light never comes. In the cave, a mediterranean bar was previously present. In front of the cave is Ogiran’s rock. During high tides or during strong southern winds, the rock is completely covered with water and poses a threat to seafarers. According to the legend, for this very reason, Odysseus had experienced shipwreck and drifted to the cave, where he took refuge. The island was ruled by the nymph Kalipso, and Odysseus dwelt with its charms as well as the beauty of its island, leaving “captured” on the island for seven years when, upon the orders of gods, it was released. The local population believes that Mljet is an ancient Ogigi because Homer in Odysseus, like on his island, states that olive groves and vineyards are just next to the shipwreck. Probably due to the disinterest of the local population, and because of their size and development in the world, but also because of the same name throughout history, the Odyssey legend is more often attributed to the island of Malta rather than Mljet. To experience shipwreckings for many is an accident, but for Odyssey this can not be said in this case. It is not so bad to sit on the beautiful, vivid island of Mljet and be “captured” in the company of the beautiful nymph Kalipso full seven years. For centuries, this Homer story has sparked imagination for many, and most of those who wanted to discover the place where Odysseus fell in love. Experts for Homer’s Odyssey who set out on the trails of Odyssey’s travel found that Mljet was best suited to the description of the ancient Ogigia-the island of Nimpho Kalipso, which inspired Odysseus. On the south coast of the island there is a cave in front of which is a rock. During the tide the rock is covered with sea and represents a great danger to the sailors. This place, as well as the look of the landscape around it, the best in the Mediterranean, correspond to the description of the Odyssey shipwreck site. Odysseus was carried to the southern winds and sea streams just to Mljet because this island has a specific position on the Adriatic: everything that doped from Otrant’s Gate ends on its banks. That is why today there are ecological dams which, during the southern winds, protect the shores of the island from the waste that comes from Italy and Greece. 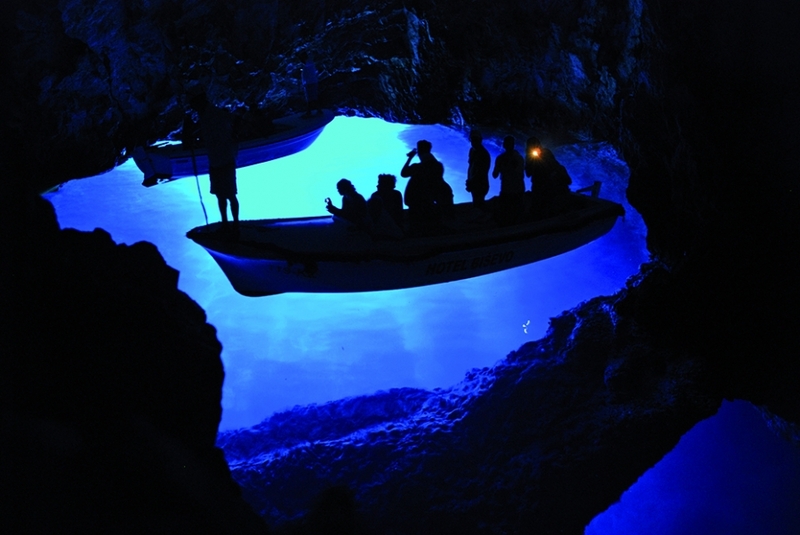 On the south side of the island of Mljet is the Odysseus cave, and in front of it is Ogiran’s rock. The cave is an egg shape with several dozen meters in diameter. There is a high vault, and the bottom is filled with the sea. Through the limestone layers separating from the open sea, the tunnel passage is formed, so it can enter into it with a floating or smaller boat. Access from the mainland is possible through very steep, improvised stairs. Odysseus cave is today used as a shelter for boats during a great weather, so it is an unusual port. In the summer months in the caves, a spectrum of colors is created, especially interesting for tourists and fans of natural phenomena. The odyssey cave was once the natural habitat of a Mediterranean bear (a type of seal), one of the poorest mammals in the world. 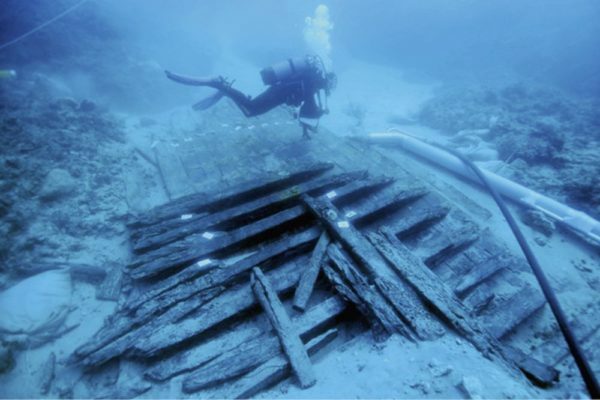 The other famous shipwreck who found his life on the coast of Mljet is St. Paul. From the shipwreck he was saved in 60 years, drifting to the area of Saplunara on Mljet. Today, there is the Holy See of St. Paul. There is an arguable statement about the famous shipwreck of St. Paul, on which numerous books and scientific papers have been written. With a stormy southern wind and holy saint, like Odysseus, was thrown through the Otrant Gate to the Adriatic Sea while sailing from the east to Rome. He reached the first coastline that he found on the Mljet road. This is what the New Acts of the Apostles (Chapter 27, 27.39-28.11) speak of. Mljet has an unusual position on the Adriatic: everything that inflames from Otrant’s Gate ends on its banks. That is why today there are ecological dams which, during the southern winds, protect the shores of the island from the waste that comes from Italy and Greece. Thus, a very similar path, carried by wind, waves and sea currents to Mljet came to Odysseus and Saint Paul. VISIT US ON FACEBOOK AND TRIP ADVISOR!